You'll be £6.00 closer to your next £10.00 credit when you purchase Normandy 1944: The Battle for Caen. What's this? Caen, a D-Day objective on 6 June 1944, did not fall to the British and Canadian troops of Second Army until 6 August, by which time much of the city had been reduced to rubble. 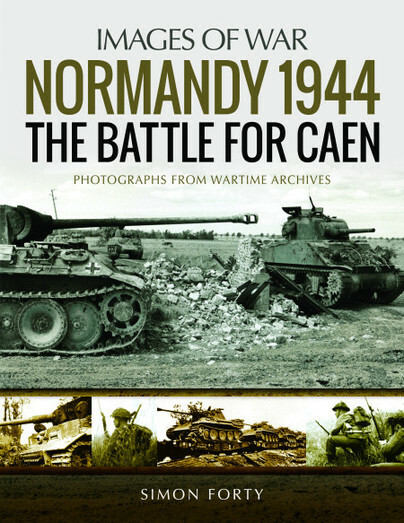 The two-month struggle was a crucial stage in the Normandy campaign and, as Simon Forty demonstrates in this photographic history, one of the most controversial. His detailed, graphic account gives the reader a fascinating insight into the opposing forces, the conditions, the terrain, the equipment and weaponry deployed – and it illustrates just how intense and protracted the fighting was on the ground. The reasons for the slow Allied advance have been hotly disputed. Deficiencies in British and Canadian equipment and tactics have been blamed, as has the tenacity of the German resistance. Ultimately a sequence of Allied operations sapped the defenders’ strength, and it is these operations – Perch, Martlet, Epsom, Windsor, Charnwood, Jupiter, Atlantic, Goodwood – that feature strongly in the striking photographs that have been selected for this book. They record in the most dramatic fashion the character of the fighting and show how even the SS divisions and heavy tank battalions were eventually defeated. Plenty here for the modeller and equipment enthusiast, as well as the wargamer and historian. It also provides a good illustration of one of the talking points of the Normandy campaign, the strengths and weaknesses of the armoured vehicles used by both sides. For someone new to studying the Normandy campaign I think this is excellent, and even those who have studied it will still find plenty to interest them. Modellers I think will like it especially for the visual references. Simon Forty has been working in publishing as editor and author for 35 years and edited Leo’s first book, on Royal Naval Frigates in time for the Falklands War—and a subsequent sellout. He has cycled and toured the Normandy battlefields on many occasions.